16402 ENT CANADA (1888) Hardware. Postal card (O) with logo printed on reverse for Adam Hope & Co. Hardware & Metal Merchants. Not easy to find! 10426 ENT CANADA (1894) Trade and Commerce. 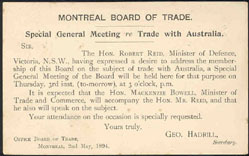 Postal card (O) with printed announcement on reverse for a special meeting of the Montreal Board of Trade to discuss trade with Australia. Fascinating piece of postal history! 16403 ENT CANADA (1894) Pulleys*. Gear*. Regulator*. Manufacturing. 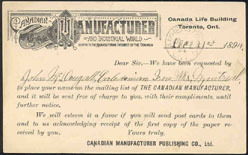 Postal card (O) with advertisement printed on reverse for a publication called "The Canadian Manufacturer." 7377 ENT CANADA (1897) Death Notice. Postal card (O) of Victoria Lodge No 1, A.O.U.W. 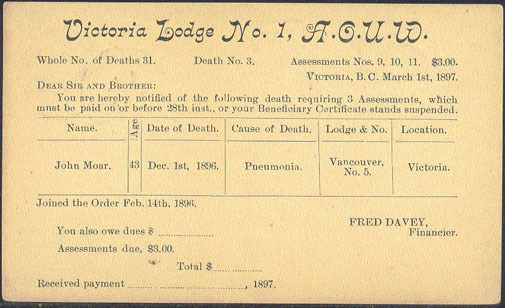 with listing on back of member death from Pneumonia. 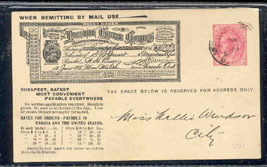 3474 ENT CANADA (1898) Money order. * Advertising postcard (O) from Dominion Express Company showing picture of money order and rates. Notice of consignment received for a customer on back. Scarce! 10928 ENT CANADA (1907) Teas. 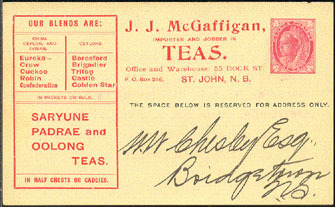 Postal card (O) with printed ad on front and printed message on back for J.J. McGaffin teas. Interesting varieties: Eureka, Crow, Cuckoo, Robin, Saryune, Padrae, etc. 7658 ENT CANADA (1930) Toronto Meteorology Office. 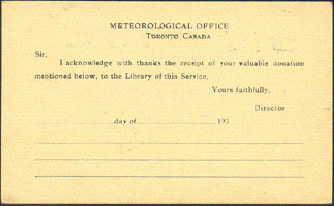 Postal card (N) with printed receipt for donation on reverse.